Health insurance planning is for a lifetime. Relying on your employer’s health insurance plan is not so bad. It’s ‘free’ after all. But most group plans fall short on addressing needs for our parents, and also when you retire, leaving us in the lurch at 60 evidently staring at the next 25 years or so without any health cover for us and our spouses. Check this article to find out why you shouldn’t rely on your company’s group health plan alone. Section 80D gives tax benefits up to a limit of Rs. 60,000 on health insurance or medical insurance/mediclaim policies including the premium paid for family and parents. Now it is easy to get these benefits online. Find out how. A family floater health insurance policy is indeed a unique concept in health insurance and most companies offer it. In a lot of cases and in comparison with an individual health insurance plan, the family floater can be a great option to ensure that our families are covered to face the financial impact of an unpredictable and large medical expense. For starters, here’s an illustrative guide to explain how a family floater health insurance policy works to benefit you. When a friend of ours tried looking for a health insurance plan (or mediclaim as she called it), she was flabbergasted. Not so much by the premium for the policy, but by the number of variants available in India today in 2014. Every company had a plan which seem better than the other company’s. As a first step, she decided to look for the broad types of health insurance plans and how each type could benefit her, before narrowing down on the company and the product. If you are also looking to buy a health insurance plan, this article is a great place to start. 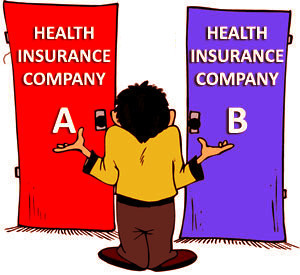 Health Insurance Claims – Which companies settle the fastest? When buying Health Insurance, product features and coverage are indeed the most important. What is also important is the Claim Settlement Ratio. But do you know that there is a huge spread in the time taken by insurance companies to settle a health insurance claim in India? Check out the details. Finally, many of us are realizing the need for a health insurance plan and planning to buy one. But are you blindly going with the cheapest plan in the market. Stop. Check Claim Settlement Ratio for Health Insurance and find out which insurance companies approve maximum % of claims.